I turn my back for a few minutes and look what happens. Kenny snacking on chicken feed. Looks like Kenny is shacking on some chicken food. I put the boys in the chicken yard last night so they could eat the grass down. This way I don’t have to mow the chicken yard. 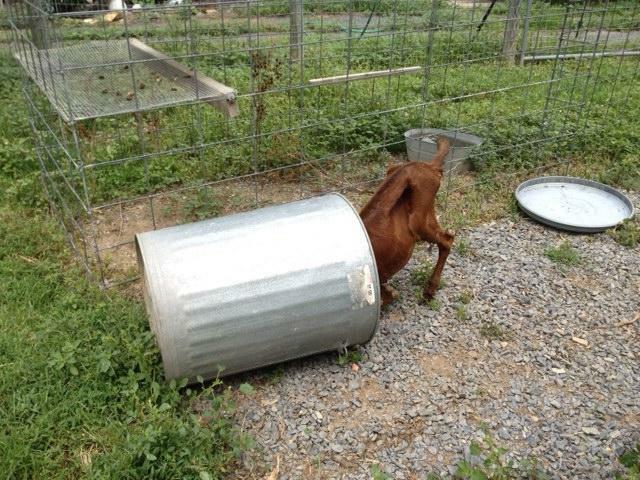 Good grief, that’s what the goats are for. I forget that they are nibbling on EVERYTHING in the chicken yard. Clearly they have learned to knock over the can so the lid will come off exposing the corn. Terrific. Guess I’m going to have to get a larger rock for the top of the can. Or better still, chain the can to the stand. I love my boys. They’re always loads of fun. But then again, my definition of fun has changed since we moved out here. Over all they are so comical; they make me laugh every day.